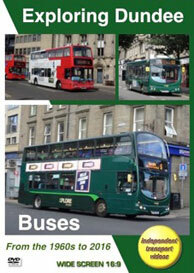 independent transport videos invite you to this special video programme to explore Dundee buses. We will be looking at the last six decades of bus operation in the city. Dundee is situated on Scotland’s east coast between the much larger cities of Aberdeen to the north and the capital, Edinburgh to the south. In the early days it ran trams and was also a pioneer of the trolleybus. Motorbuses arrived in 1921 and were operated by the corporation and carried a blue and white livery until 1934 when it became green and white, later changing to all over green in the 1960s. Alexander ran the country services and in 1962 became Alexander (Northern) introducing a bright yellow and cream livery. In 1975 the corporation buses became two-tone blue and white when they were transferred to Tayside Regional Transport. In 1991 the company was sold to it’s managers and employees and in 1997 to the current owner, National Express. The buses were painted in the standard ‘West Midlands’ colour scheme, initially in blue, white and red and later in the white with a red front livery. In 2015 the buses became green once more when National Express changed the livery to a smart two-tone green scheme using shades of green very similar to the 1970s. We start this programme with some cine footage from the 1960s and 1970s courtesy of Bob Webster. We see the former London Transport, Cravens bodied AEC Regent ‘RT’ buses in service running alongside the Daimlers and AECs of the corporation. AEC Regals are also seen representing the single deck fleet. We then move to 2014 with some video from the camera of Raymond Hulse. Here Raymond captures the fleet in ‘Travel Dundee’ livery, which is white with red fronts. We also see some Stagecoach vehicles running in service. The main section of our programme is footage shot by our own cameras in Dundee during the summer of 2016. The fleet has now been rebranded as ‘Xplore Dundee’ and a new two-tone green livery is being introduced laid out in the style of the two-tone red of West Midlands and the two-tone blue of West Midlands – Coventry fleet. Filming takes place at a large number of locations. These include Commercial Street, Seagate, Nethergate, Dock Street, Meadowside and many more. At the time of filming the fleet was made up of mostly Volvo double and single deckers, the types being B7L, B10L, B10BLE and B7TLs. There are also some Enviro400 hybrid double deckers (E40H) in the same green and white livery of their West Midlands cousins. We also see ADL 200 single deckers and new Wright Streetlites. A number of the Plaxton President bodied Volvo B7TLs have recently been transferred from the West Midlands fleet, with some now painted in the new green livery. We also see members of the Stagecoach East Scotland fleet in service. These include brand new Enviro400MMC bodied Volvo B5LH hybrid double deckers and look out for 16930 (710 - SP03 GDK) an East Lancs bodied Volvo B7TL smartly turned out in ‘Strathtay Scottish’ heritage livery. Our filming concludes along East Dock Street as we see the buses returning from service travelling back to the depot. To complete our review we present a ‘Photo Gallery’ of Dundee buses from the itv archives taken in 1976 and 1985. We do hope you enjoy your exploration of Dundee buses!